The smoked bacon and leek black pudding was developed in ‘The little kitchen’ a smaller factory built within the heart of the pudding mill, where Andrew Holt, MD of Real Lancashire Black Puddings dedicates time and attention to creating specialist products using the knowledge he has gained over the past 23 years. Andy stated ‘it’s really taken off, we knew the Bacon and leek black pudding was tasty and our customers love it and this award has confirmed it. We were really happy to get this outstanding result at the Great Taste Awards’ The Real Lancashire Black Pudding company has won over 190 awards for the products in its core range, developed the ‘World First Vegan Black Pudding’ and was the first to produce ‘The Chilli Black Pudding’. Its also not the first award this product has won. 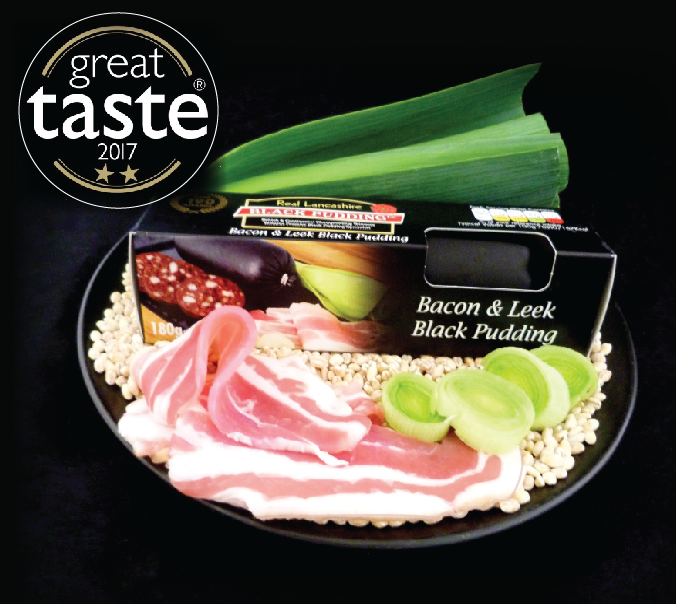 In 2016 the Smoked Bacon and Leek Black Pudding won the best black pudding in category at the National Meat Products Awards. The competition which is entered by butchers all over the nation has some 20+ categories and is highly recognised within the meat trade industry. To learn where you can get your hands on our Bacon and Leek Black Pudding and our other award winning products such as Black Pudding, White Pudding, the original Chilli Black Pudding, tripe and more visit our buy from page.